One to 3 inches of rain has fallen over most of the warning area with local amounts up to 5 to 6 inches around Cobb Mountain in Lake County, and 5 inches around Magalia from Tuesday night. through early Wednesday evening. More rain is on the way, with an additional 2 to 4 inches over the Coastal Range and Shasta County mountains, and 4 to 8 inches over portions of the West Slope Sierra Nevada through Thursday evening. Recent burn scar areas may also experience minor mud, rock and debris flows, especially if thunderstorms develop in the burn scar areas on Thursday. This includes portions of the Mendocino Complex burn of area in Lake, Glenn, Colusa Counties, and the Camp Fire burn area in Butte County in Northern California. 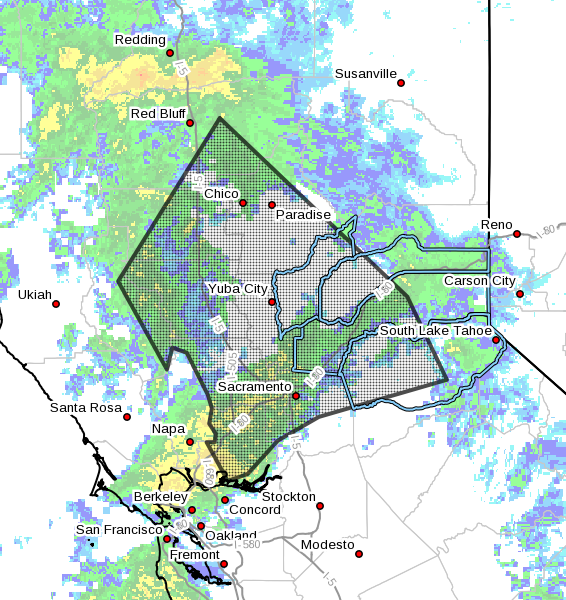 Some locations that will experience flooding include:Sacramento, Elk Grove, Roseville, Fairfield, Vacaville, Chico, Citrus Heights, Folsom, Davis, Rocklin, Woodland, Paradise, Oroville, Auburn, Grass Valley, Marysville, Placerville, Corning, Orland and Willows.